Torque Solution Solid Rear Subframe Bushings!!! Intro Pricing.. PM for DETAILS!!! We are offering special pricing to the 1st 10 members of 6speed to pick up a set of these.. PM for details..
A Porsches rear subframe is the heart of the suspension. When the subframe moves, so do all the suspension mounting points. 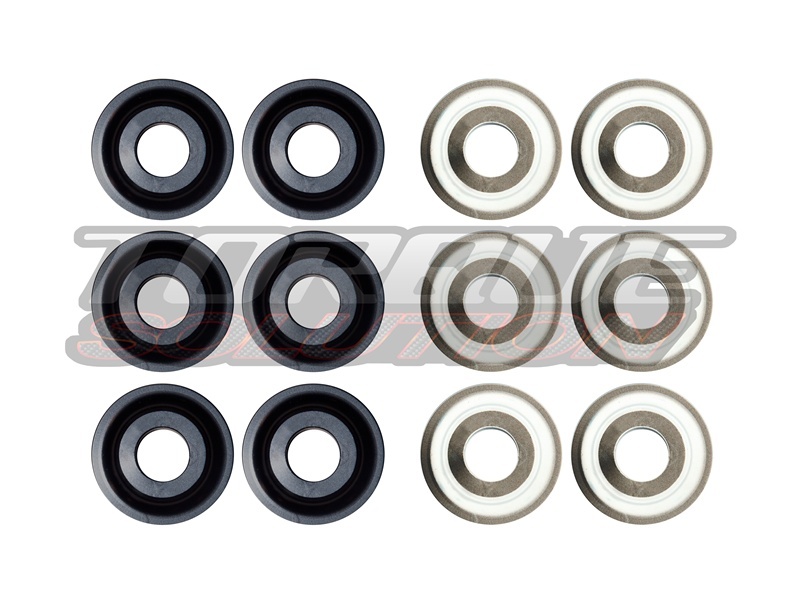 Replacing the stock rubber bushings with solid ones limits both drivetrain and suspension movement, eliminating the unwanted movement and keeping your Porsches setup the way it should be. These solid mounts will also help prevent the subframe from excessive movement during racing conditions. We spend lots of extra time machining each Torque Solution subframe mount to keep your car as solid as possible. CNC machined from high grade billet aluminum and nickel plated steel for precision and quality. These solid subframe bushings fit all Porsche 996/997 models..
Sold as a kit of 12 pieces for all 6 mounting points..
reviews coming shortly!!! stay tuned!! I would like a set. I was working on the car today and notice how much the sub frames move when I removed the cross brace and feel these solid mounts would help this. Lets not talk about lowering the car 1/2 with out changing the stock geometry, or the fact that all the GT cars come with solid mounts, not 1/2 lower though. PM sent! Your set left last week Tim.. Thanks!!! Is there any urethane on these or are they completely solid? Guys, I finally got around to doing the install and was able to change remove the stock bushing with the sub frames in the car. I did not unbolt the shocks or mess with the wheel carrier or the E brake even the axle and breaks were left on. If I had another set of hands around I would have taken pic's. Keep in mind I do have a lift and used a puller on one and made a tool to push out the other two of the three rubber bushings. I also have mono ball upper and lower arms so with stock you may need to loosen the bolts to get the range of motion needed. Mike thanks for the great product. gt2/3 are solid also. Install was straight forward. The fact that they raise the sub frame up is so huge. People who would like to lower their cars will get around a 1/2'' and retain the stock geometry. No need for done bones and toe arms.. hope this helps..
Quick Reply: Torque Solution Solid Rear Subframe Bushings!!! Intro Pricing.. PM for DETAILS!! !